Stranded by the MTA on a weekday evening in Downtown Brooklyn I decided to walk part of the way home, rather than face an interminable wait underground. My walk took me to Atlantic Avenue, and then up Court St into Carroll Gardens, where I saw the neon lights of Sam’s Itlaian restaurant. Sam’s has been open in Brooklyn for something like 50 years, and I’d been there once before (though I don’t really remember anything about it). It’s one of the few true neighborhood institutions still open; Sam’s is the kind of place where they know the names of almost all of their customers, where the overhead music hasn’t been updated since 1970, and where they pat you on the shoulder when you order. 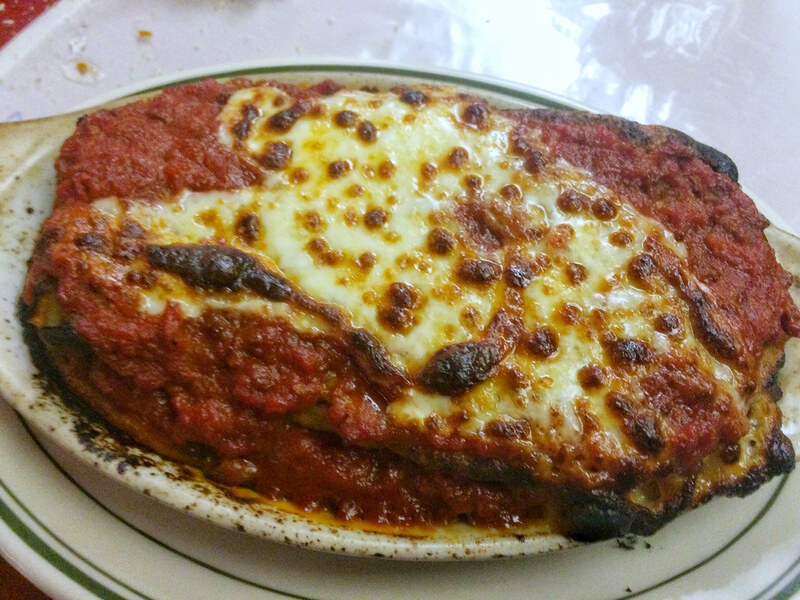 Although Sam’s specializes in pizza they have a full men of Italian-American classics, of which I ordered the eggplant parmigiana (the plate, not the hero). The eggplant was silky smooth, and the sauce both sweet and savory, and the bread warm and crusty. Sure there’s nothing novel or trendy about Sam’s, butthere’s a reason they call them classics. This entry was posted in carroll gardens and tagged carroll gardens, italian, sam's. Bookmark the permalink.